BREAKING NEWS UPDATE: North West Premier Supra Mahumapelo this afternoon (19 April 2018) confirmed to the SABC that he has now suspended Health Deapartment HOD Dr Thabo Lekalakala. Spotlight revealed that Lekalakala had not been suspended but placed on special leave. North West’s health services have been in the spotlight for alleged corrupt practices involving healthcare delivery since February when details were revealed of a R30-million pre-payment to Gupta-linked healthcare company Mediosa with another R150-m to follow. The “contract” involved the delivery of primary healthcare services that the province had the capacity to deliver internally. Health minister Dr Aaron Motsoaledi visited the province in early March where he described the contract between the North West health department and Mediosa as nothing but “an ATM card for the Guptas to withdraw money from the department”. However, documents in possession of Spotlight reveal that Mediosa may not be the only company using the North West health department as an ATM. 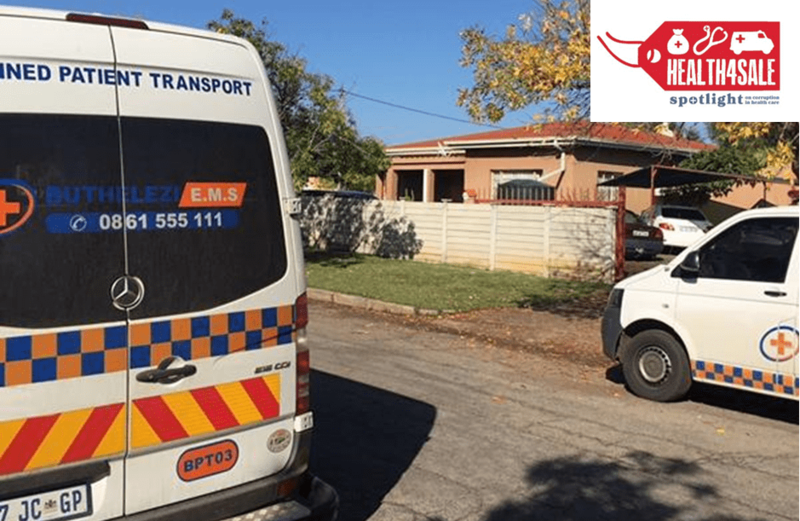 Private ambulance company Buthelezi EMS, which operates under variations of this name including more recently B EMS, have held a contract with the North West Department since March 2016. Buthelezi is being paid between R600 000 and R1-m a day to mostly deliver inter-facility hospital transfers in the province. Inter-facility hospital transfers are the transport of patients by road ambulance from one health facility to another, either for specialist consultations or because they need a more specialized level of healthcare. It also works in the reverse with some patients sent to a lower level hospital once they respond to specialist treatment. This service is provided by the provincial health departments in most provinces. Popo Maja, spokesperson for the national health minister was adamant that the current public emergency medical service has the capacity to undertake inter-facility transfers. “In the rare situation, where there is an urgent inter-facility transfer and all ambulances are engaged in EMS responses, there is provision for the EMS manager to engage the services of a private EMS provider. This option should only be in exceptional circumstances,” said Maja. The North West health department has over 60 ambulances on the road, but an official told Spotlight that the HOD and his supporters had “created a hole for Buthelezi to fill”. Not a single ambulance post has been filled in at least three years and money earmarked for the purchase of new government ambulances was redirected to other areas. Buthelezi EMS invoices on average well over R20-million per month, amounting to in the region of R3 000 per patient allegedly transported. Figures seen by Spotlight reveal that Buthelezi EMS submits hugely inflated invoices for almost every patient they transport, overcharging on average a staggering half a million Rand per hospital per month. However, efforts by some health officials to put a stop to this looting has not had an effect with the head of the provincial department of health Dr Thabo Lekalakala sending out an instruction that all Buthelezi’s invoices be submitted to and paid via his office. This meant that no invoices could be checked or corroborated by Treasury or Department of Health officials in line with good governance practices and the law. There are also damning allegations that Buthelezi was awarded the contract after the initial tender specifications were illegally adjusted when the tender was awarded to expand Buthelezi’s scope from only supplying P1 services to the more lucrative and higher volume lower level P2 and P3 services which require intermediate and basic life support services. P1 is very serious, potentially life threatening; P2 means the patient needs to go to hospital, can become life threatening if not treated and P3 is minor injuries. P4 refers to a deceased patient. Discrepancies also include allegations that although the tender specifications indicated that the tender would cover only transfer between hospitals, this was expanded to include clinics and Community Healthcare Centres when the tender was awarded. The province was already providing a service to clinics and community healthcare centres – shifting this work to Buthelezi EMS allowed the company to increase their volumes significantly. Another discrepancy is that the tender required that the successful bidder have a presence (ambulance, response car, advance life support paramedic) in each sub-district. It is a known fact among healthcare workers and departmental staff that the Buthelezi company does not have such a presence in all districts they service and for example patients requiring trauma care in Wolmaransstad have to wait for an ambulance or paramedic to arrive from Klerksdorp 80km away. There are reports from various healthcare workers that the service provided by Buthelezi is not good. A private health care provider who works at trauma scenes in North West said they never saw Buthelezi paramedics on emergency scenes. “I have never seen them on a scene around Potchefstroom or Klerksdorp, in fact it is often private providers who do not have contracts with the Department who will be the ones treating indigent patients on the scene, stabilizing them and taking them to hospitals,” the person said. A paramedic alleged Buthelezi was often not interested in sticking around when there were dead patients as they “not keen on doing the paperwork”. A visibly angry Motsoaledi demanded during his visit in early March that Lekalakala be removed from his post with immediate effect. “I want him [Thabo Lekalakala] to face charges. I don’t think he is fit to work anywhere in the public service, least of all as an HOD. Mr Lekalakala is hired by the premier of the North West. The premier must start taking steps to remove him,” Motsoaledi told journalists. Spotlight understands that Lekalakala has not been suspended by the Premier Supra Mahumapelo, who appointed him, but the Health MEC Dr Magome Masike has placed him on special leave. Various entities have called for Lekalakala to be suspended including trade union Nehawu, who have embarked on protracted labour action to force the HODs removal. This action is now leading to drug stockouts and patients arriving at health facilities with no nurses on duty. Lekalala was a controversial appointment from the start with reports that the Economic Freedom Fighters and the Young Communist League criticized his appointment claiming that Premier Supra Mahumapelo has simply brought him in to rubber stamp tenders. They also claimed his appointment was irregular and that he did not have the required experience as stated in the job advert. Many were surprised when Lekalakala was appointed HOD from the National Department of Health where he occupied a low-level Director position. 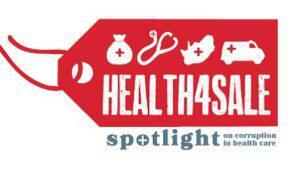 Spotlight sent a number of questions to Buthelezi’s CEO Thapelo Buthelezi. He failed to provide a response to any of the questions, but sent a letter instead in which he among others accused Spotlight of “probably doing this to me because I’m a black businessman and you are indirectly promoting a white monopoly capital and unhappy with a black successful business”. Spokesperson for the Hawks in the North West Captain Tlangelani Rikhotso confirmed that they were investigating the contract between Buthelezi EMS and the North West health department, but “we cannot divulge any more information in relation to the case”.